Are you ready for some juicy games? 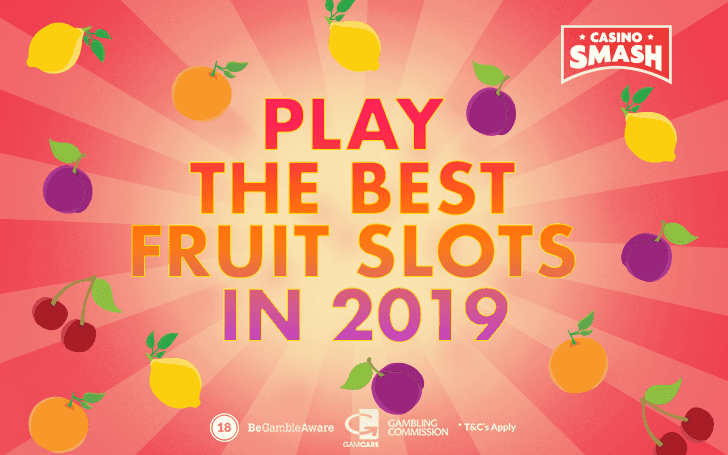 Check out our list of the best fruit Slot machines and where to play them! The number of video Slots out there is overwhelming. Just go to any online Casino and you will be blown away by hundreds of video Slots with intricate graphics and elaborate soundtracks. But what if you want to go back to the good old days when the only choice was a fruit machine Slot? Sometimes nostalgia can hit hard, making you miss the classic fruit Slots that you once could find at every brick-and-mortar casino. Fruit machines can be flavorful and satisfying if you haven’t played them before. Or even if you have. If you’re a hipster and a gambler, you simply can’t live your life without having played some beautiful fruit Slots. 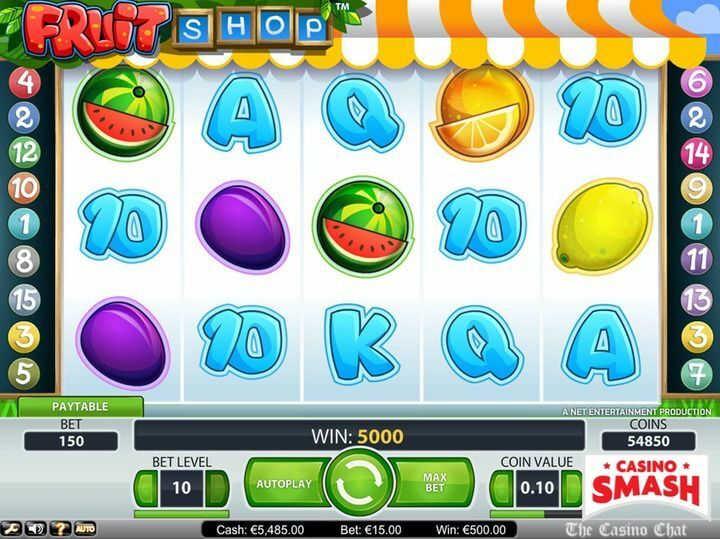 So now, let’s dive into the world of the best fruit Slots online. You can play all Slots on this list for free and for real money. Let’s take a look at the games that are definitely worth your attention. Forget the typical lemons and watermelons. Sizzling Peppers will spice things up in the fruit Slot department. 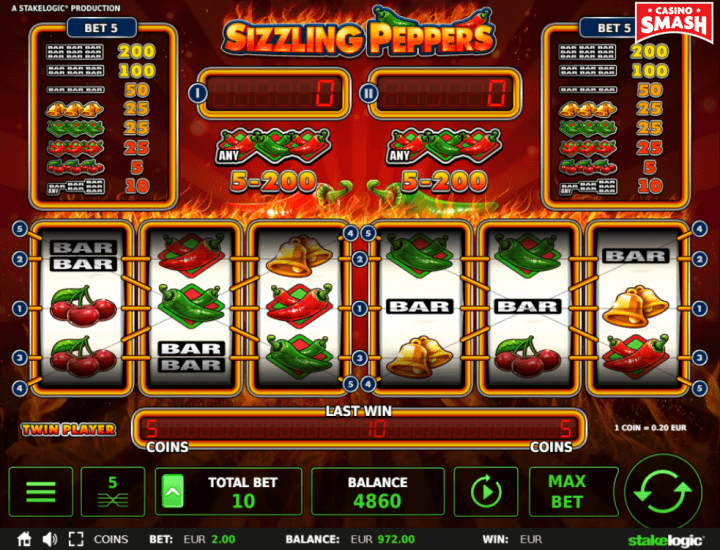 When you open Sizzling Peppers Slot by StakeLogic (Novomatic), you see typical 3x3 reels with five paylines. But instead of one, there are two side-by-side reels on your screen. And you spin both at the same time. They include classic symbols, such as bells, bars, and cherries. But two types of chili peppers makes things hot. Apart from the usual paylines wins, you get a Mystery Win every time you land a combination of two red and green peppers on the payline. Also, you get a Bar Prize once you land a combination of Bar symbols on the reels. 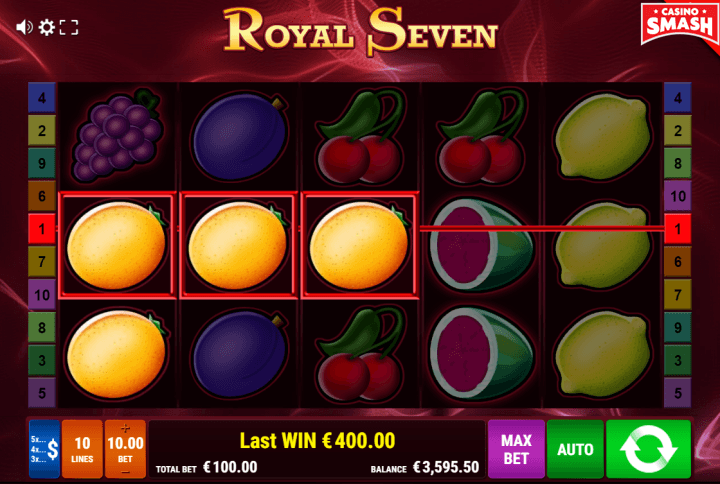 Royal Seven is yet another classic fruit Slot, developed by Gamomat. 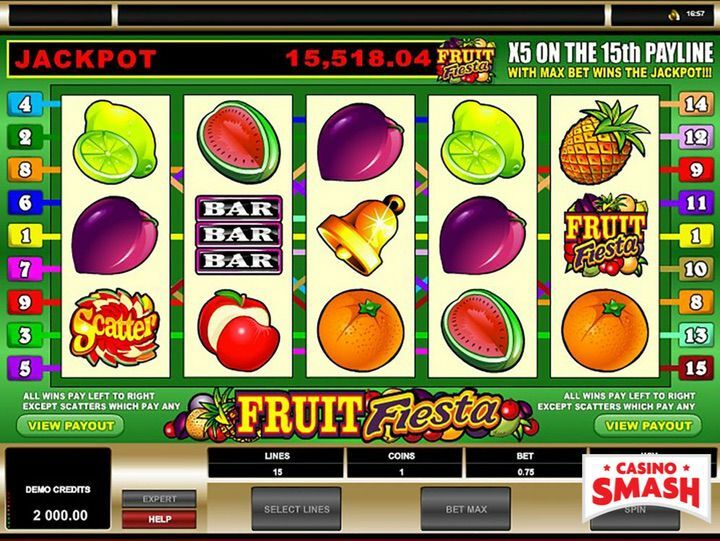 While it has classic fruit symbols, such as lemons, oranges, cherries, and grapes, it features more reels (five) and paylines (10) than retro Slots. It doesn’t have many special features but you can gamble with your winnings. And there are two ways how to do it. First, you’re taken to a funnel-like figure with different amounts of money. The highlight of different sums jumps back and forward to the sum that’s double your win and 0. You need to press gamble button at the time it’s highlighting the double sum to win it. You can also gamble with half of your win. Second gamble way is the classic one: guess the color of the card facing down. You guess right and your winnings are doubled. You guess wrong and you lose what you’ve won with the previous spin. StakeLogic proves again that their fruit Slot twists are juicy and genius. 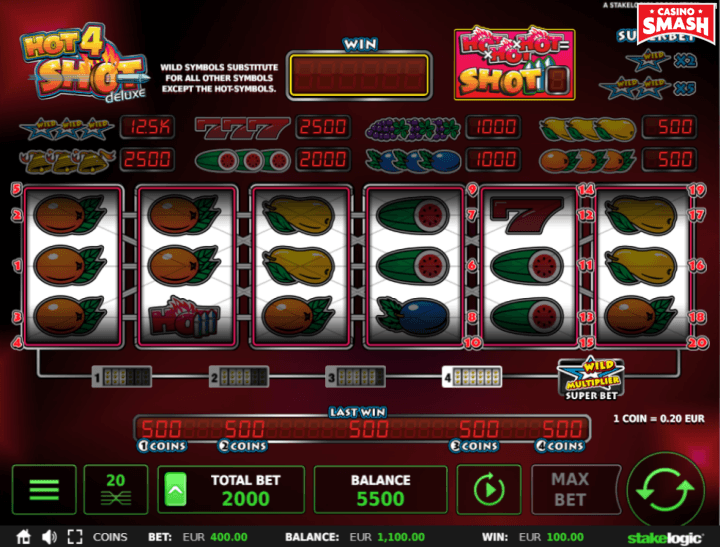 Hot4Shot Deluxe looks a little bit like Sizzling Peppers Slot at the first glimpse. It also seems they have two side-by-side retro reels that you spin at the same time. Except that’s not how it works. 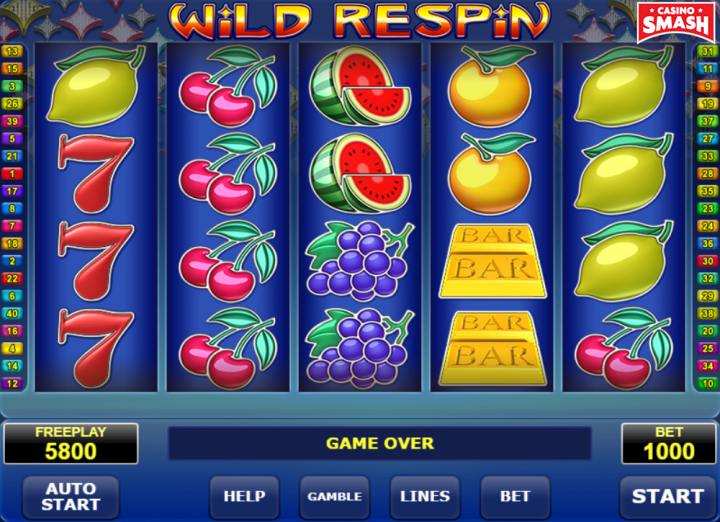 In fact, you have a six-reel fruit Slot where winning combinations are made out of three symbols each. But they can be aligning anywhere on all the reels. For example, you can land three sevens on the first, second, and third reel; second, third, and fourth; third, fourth, and fifth; fourth, fifth, and sixth, and any of these combinations would still trigger the win. That’s why the Slot has a total of 20 paylines. What’s more, you have wild and bonus symbols. Three or more bonus symbols trigger Hot Shot feature. The reels are turned into a shooting area. The light is jumping from target to target until you press the Hot Shot button and fire. What prize you get depends on which target you hit. Wild Respin is a fruity masterpiece by Amatic Industries. It has an RTP of 96 percent and you can win up to 1,000,000 coins if any lucky spin covers the reels in 7s. It features lemons, watermelons, grapes, and other lovely fruits. But at the same time, it’s the most advanced fruit Slot in terms of structure on this list. Unlike many retro Slots, it has five reels, four rows, and 40 paylines. Also, the Slot features a kickass Respin bonus. If you land four of the same symbol on the first reel and a wild symbol anywhere else on the reels, it makes these symbols stick and triggers a respin. If you land any extra symbols of the same kind or wilds, you get another respin. And it goes on until all your reels are covered in the same symbol and/or wilds or no extra symbols appears. Double Stacks is one of the latest free fruit Slot machine by NetEnt. It has a simple five-reel 10-payline structure. And while it still features all the classic Slot symbols, they come with a twist. If the symbols of the same kind take up the whole reel, the symbol is doubled. You get two 7s, diamonds, bars, or your favorite fruits in one. And they will be counted as two when it comes to calculating the wins. You can trigger up to 30 free spins with the scatter symbol and up to €200,000 winnings if all reels are covered with the same high-paying symbol. Now here’s something truly lighthearted! Fruit Shop is also developed by NetEnt. Even though its design is simple, it doesn’t fail to be a fun and exciting quick play. Like in a real fruit shop, here you'll find cherries, plums and any other fruit you can think of. The game has five reels and 15 paylines. You can also win additional free spins! Visit this Fruit Shop for some extra fiber! 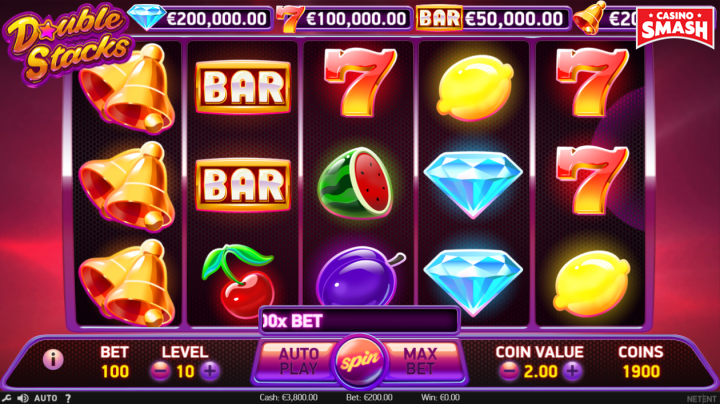 Relax and settle down after a hard day’s work with this Slot by Betsoft. Fruit Zen is different from the previously mentioned games. Why? Because of its graphics! This Slot machine is one of the most beautiful fruit Slot games out there. You can tell you’re in for some quality time as soon as you see the loading screen. The background depicts a gorgeous sea with a wonderful, colorful sunset. The fruits are nicely animated too - real eye-candy! 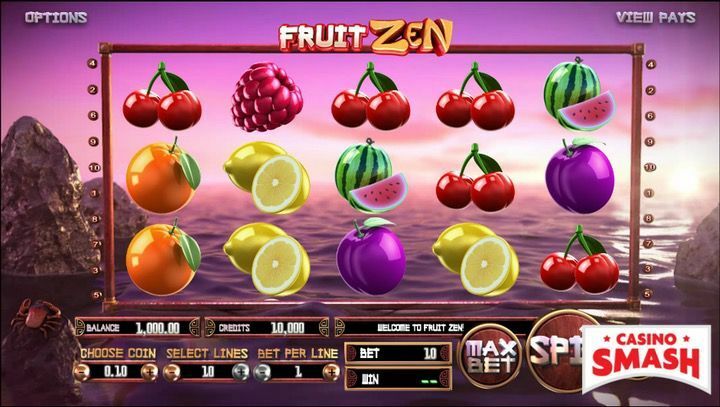 Fruit Zen has 10 paylines and five reels. You can collect re-spins and win big. 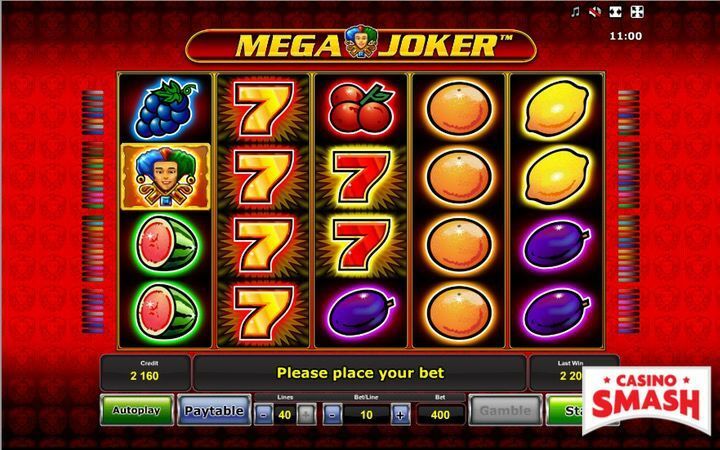 Mega Joker by NetEnt is as nostalgic as a Slot game can get. This game is a true classic - just take a look at the design! Once you open it, you can see a realistic slot machine from the times when there were no online Casinos. If you call yourself a Slots fan, you must try it out! It is one of the simplest Slot games we’ve ever seen. There are only five paylines and three reels. However, it is possible to win big with Mega Joker. It is a progressive jackpot Slot machine that has some neat bonuses. As for fruits, there are symbols of cherries, watermelons, lemons, oranges, and grapes. Just like in the past! Tired of ordinary Slots? Want to play something truly different? Make your best bet at Fruit Warp! This Slot game by Thunderkick is unique enough to be on this list. I’d even say that it is one of the best fruit Slots of all time! Because you won’t see your typical reels and paylines in this one. Here, you spin the machine, and *SPLASH* - you have a bunch of fruit scattered all over your screen! Collect at least four fruits for a re-spin. Get five or more and activate the Fruit Mode. Multiply your winnings for the best results! 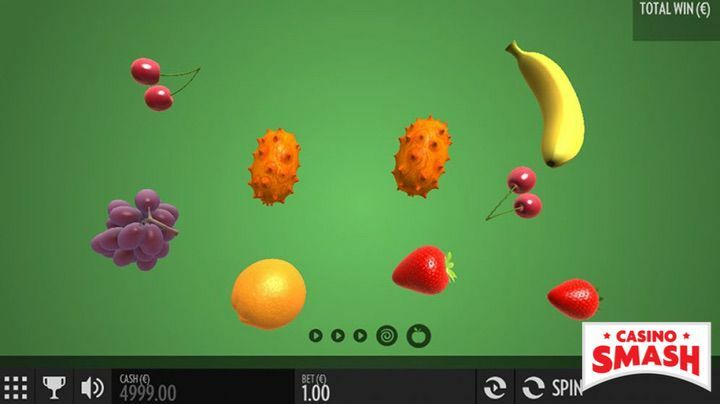 Fruit Warp features not only your typical cherries and plums, but also some delicious star fruits and horned melons. Yet another classic game, Fruit Fiesta 5 Reel will let you have some old-fashioned fun. It is a progressive jackpot Slot machine by Microgaming that has 15 paylines. You spin symbols that depict fruits like pineapples, oranges, lemons, etc. There are also some usual symbols like the bell and the bars. Play Fruit Fiesta 5 Reel to have some a taste of that authentic brick and mortar casino experience. Fruitinator is a juicy Slot game by Real Time Gaming. It is a non-progressive Slot machine with five reels and five paylines. 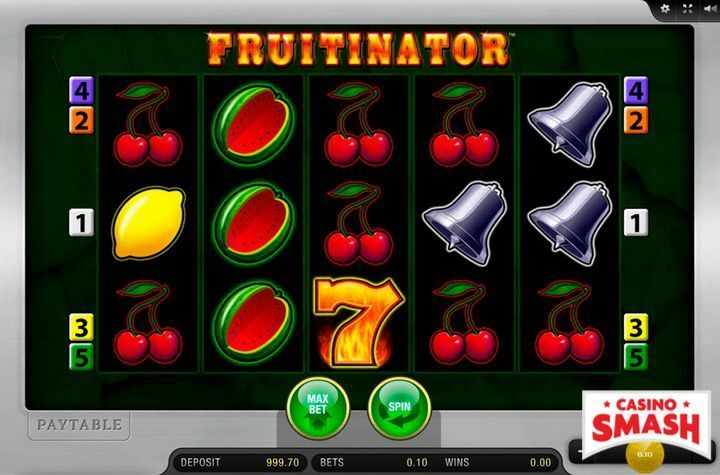 Fruitinator is a very simple Slot game to play. You need to collect at least three matching symbols to win some cash. Spin and witness how the lemons, cherries, oranges and other fruit create combinations that let you win! If you start craving for some fresh fruit but don’t have a PC by your side, that’s not a problem! You can play all these fruit Slots on your Android and iPhone. Just open the games via your mobile browser. 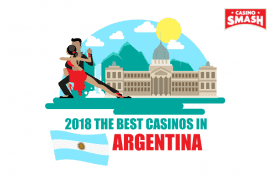 Each Casino game on this list is fully adapted to support mobile devices, so there's no good excuse not to play these Slots! You may want to grab a snack before playing any of these games. Otherwise, you’ll start thinking about digging into some nice fruit, and your gambling session will be over before you know it! Bonus info: terms and conditions apply to the offer. If something isn't clear, have a look at our review of Omni Slots Casino for the T&Cs in full. The offer on this article might have expired by the time you read it. Please refer to the review pages for the latest bonuses and promotions available.